The fault context menu allows you to quickly manage the faults in the views. In a view, right-click a fault stick or the tessellated fault surface to open the context menu. Pick "fault" — Click this to enable picking on the existing fault sticks. Delete fault stick — Click this to delete an entire fault stick quickly without having to remove the picking points one by one. In the 3D View, you can select multiple fault sticks (press Ctrl and click the fault sticks) and then right-click and select Delete 'X' fault sticks. X is the number of the fault sticks you have selected. Tip: You can also delete all fault sticks by clicking on Remove all sticks in the Details Panel. Unassign fault stick — Click this to unassign a fault stick (or multiple fault sticks) from its current fault (see Assigning/Unassigning Fault Sticks). 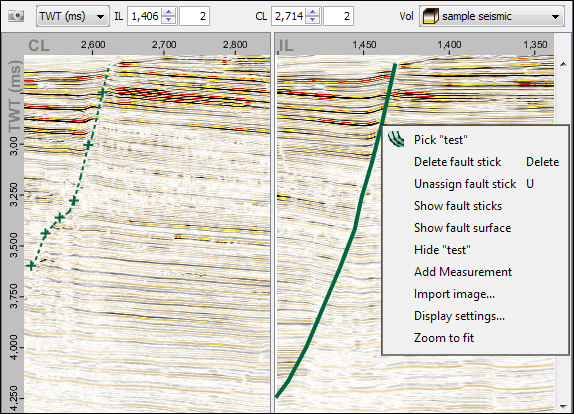 Show fault sticks — Click this to display/hide the fault sticks in the section and 3D views. By default, the fault sticks on slices are shown in the views. This is the same as selecting/clearing the Show fault sticks check box in the Details Panel in the Fault tab. Show fault surface — Click this to display/hide the fault surface in the views. By default, the computed surface of the fault is displayed in the views. This is the same as selecting/clearing the Show computed surface check box in the Details Panel in the Fault tab. Move fault stick to "New Fault" — Click this to move a specific fault stick from one fault to another, or to assign an unassigned fault stick to a fault (see Assigning/Unassigning Fault Sticks). To see this context menu option, you must first enable the picking mode of a fault. Hide "fault" — Click this to hide the fault from being displayed in the views.